You may be able to visit Lordran, Lothric, and other locations from the Dark Souls series in virtual reality sometime in the future. 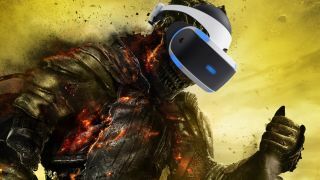 During the pre-show for the 2016 Golden Joystick Awards, host Julia Hardy asked Dark Souls 3 producer Atsuo Yoshimura what his thoughts were on the burgeoning virtual reality tech and if we would ever see Dark Souls in VR. "Yes…?" he said nervously before laughing and following up with "We're hoping." If I had to guess, I'd wager that this means FromSoftware is at least prototyping a VR experience set in the Dark Souls universe. It may never see the light of day at retail, but by working on such a project, FromSoftware can learn how to leverage its strengths as a studio with the opportunities afforded by the new tech. So even if we never get to play it, hopefully such a project makes FromSoftware a stronger, better developer, especially with regards to VR. Who knows, maybe it could lead to a wholly original VR game down the line. Take a look for yourself and see how you interpret Yoshimura's words. You can skip to the start of the interview at 45:36, or get right to Hardy's question about VR at 52:30.